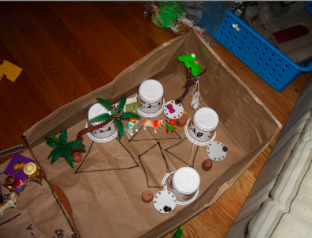 Planetpals Recycle Play: Use everyday recycled materials and objects with toys to create a Planetpal! Available in our Magazine, forum or email news only. Planetpals crafts are educational , fun and free. Download them all and have a world of fun from your favorite Pals. Remember USE RECYCLED MATERIALS when possible! That includes recycled papers from magazines, newspapers, and the other side of school work! At Planetpals we believe if you teach kids to appreciate beautiful things on Earth, they will learn to love and care for it! It's that simple. Arbor Day, Earthday, America Recycles Day. This is simple for any age! Use paper tubes, cardboard, tissue-ideas and instructions. Our most popular craft! Many styles to choose from, mix with your favorite playmobile toys or doll. Make an apt building, garage, strip mall-diagrams to download Free Patterns for Buildings! Paper Bag Buildings: Planetpals Exclusive! Another great add on toy. 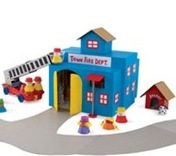 Great for travel to play with matchbox or playmobile people. Fold and carry! Make a Town. Use recycled bags. Teach Kids To Play The Recycle Way! 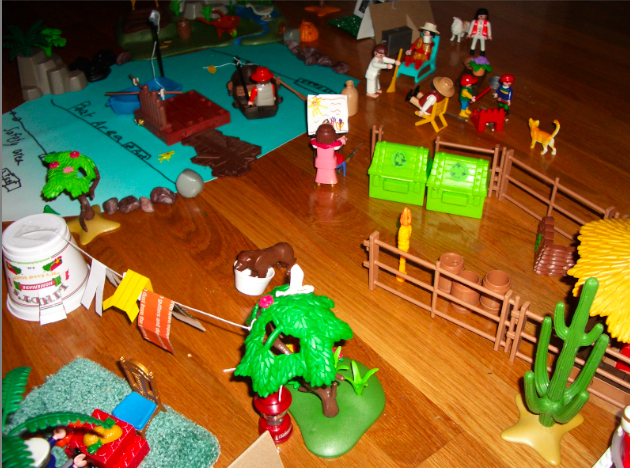 Planetpals Recycle Play: Use everyday recycled materials and objects with toys and turn your kid into a Planetpal! The everyday toy sets you buy on the store shelves are great, but imagine expanding them to be even more educational and interesting to your child? 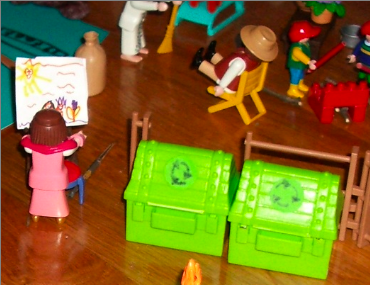 If you incorporate recycle play with regular toys kids will learn to be inventive, creative and think green. 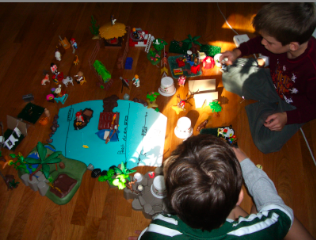 So, the next time you pull out Legos, Matchbox or Playmobile, why not consider adding some recycle materials to the mix, as well as, throw in a lesson on Earth? 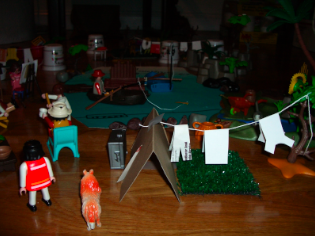 In this particular play session we took play sets and toys from our collection of Playmobile, Matchbox and Legos and added a whole lot of recycle materials to create a campground. The children were 4, 7 and 8. 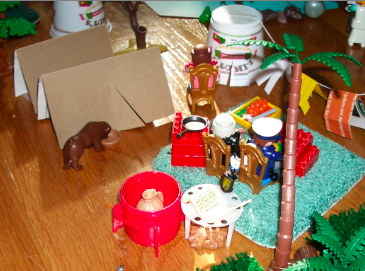 Each child worked at their level to add to the scene. Each one tried to solve problems :For instance,if they wanted the Playmobile kids to be toasting marshmallows what could they use for the marshmallows and so on. In then end, it was an exciting accomplishment. Since then we have collected items to add to the next campground and a slew of ideas for new scenes such as a city or a zoo. Ideas are like that...one sparks another!